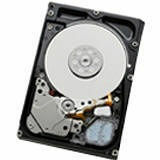 HGST delivers the world's fastest hard disk drive in the Ultrastar® C15K600, a 15K RPM, 2.5-inch small form factor hard drive ideally suited for mission-critical data center and high performance computing environments. At 600GB, Ultrastar C15K600 provides double the capacity of current generation 2.5-inch 15K drives, and matches the highest capacity point of 3.5-inch 15K drives. This latest addition to the Ultrastar small form factor (SFF) family outperforms not only the competition but also legacy 3.5-inch 15K drives from HGST, achieving more than 38% faster sequential and 2.5X faster random write performance for faster data processing while consuming less than half as much active and idle power. Ultrastar C15K600 leverages an industry-leading 12Gb/s SAS interface and offers the broadest range of security and encryption options available on enterprise-class hard drives, including Instant Secure Erase (ISE), Trusted computing Group (TCG) enterprise SSC-compliant Self-Encrypting Drives (SED) and TCG enterprise SED with FIPS (Federal Information Processing Standard) 140-2 certification, level 2.